Matt Trevisan of Linne Calodo is one of Paso Robles' hottest cult winemakers, and has the most interesting personal story I've heard there. He started making wine when he was working as a forklift driver and living out of his car, and sold all of his assets to buy labels and capsules for his first vintage. But I don't care about all that (though I promise to tell you more about it). I just want to beat him at ping-pong. 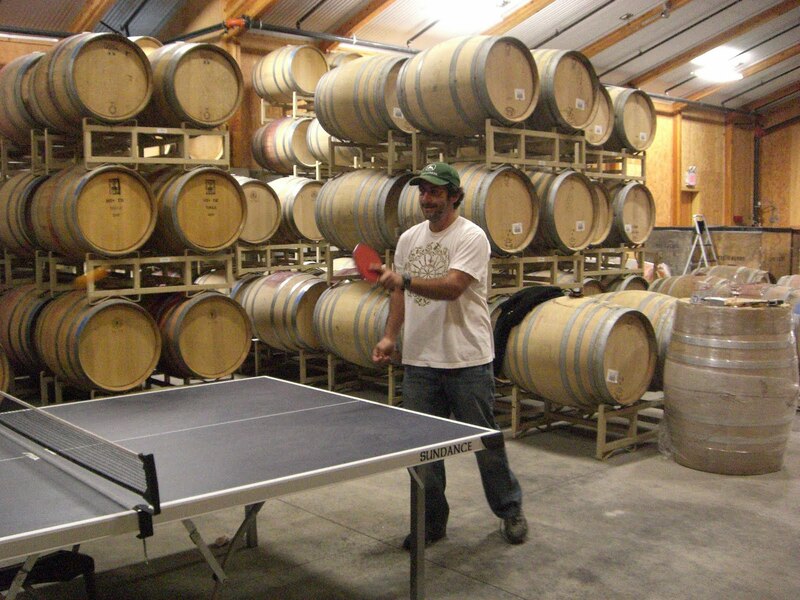 Matt, 38, has two tables at his winery and a selection of paddles. He says he plays about 10 games a day. When a ball rolled away under barrels of his fermenting wine, he'd say, "Don't worry, I've got another." And he plays ambidextrously. What made me think I could take him? I'm no Forrest Gump. In fact, I'm not all that great, and hadn't played a real game in 9 years. But when I had the best job of my life at an Internet 1.0 company -- (free Webvan food deliveries, sushi parties on Fridays) -- I played several games a day against players much better than me, so I'm not intimidated by superior skills. Matt's a laid-back surfer type from the San Diego area (Escondido), but he does know the mental game. As soon as I showed interest in playing him -- while we were tasting some of his Sticks and Stones Rhone-blend wines, $68 cult items snapped up by his mailing list -- he asked me what my strategy was. What are my best shots. What are my weaknesses. 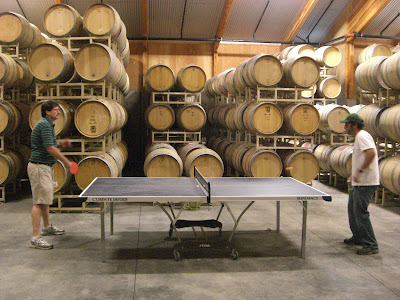 Matt's winemaking persona is completely different from his ping-pong. Before he would consent to play me, he ran off a list of strict house rules: all serves must be open-handed, no this, no that. For winemaking, though, his favorite statement is "There are no rules." H e says it over and over. He crushes straight into barrels and says he never makes a barrel full of any one grape variety: instead, he fills it about 75% full with one thing, and tops it off with something else, chosen mostly by its pH, but also by taste and feel. He ends up, a few months after harvest, with 150 barrels of different combinations of Rhone grapes, which he tastes and then figures out how he wants to blend. It's so casual that you'd think he was at one of Paso's stoner-sounding labels, Chronic Cellars or Dark Star. Instead, he regularly scores more than 90 points from the Wine Advocate. I pointed out this dichotomy and it was the only time he got slightly defensive: not when I asked about his home life or finances or the fact that, for me, his wines could have a little more acid. Matt takes ping-pong way more seriously than he admits. "I don't have that many rules (for ping-pong)," he insists. "I need them because people come in here and try all kinds of tricks." And Matt usually gambles: if the visitor loses, they have to buy some of his wine, which ain't cheap. Of course, one could say the loser wins, which is probably why he gets so many games going. 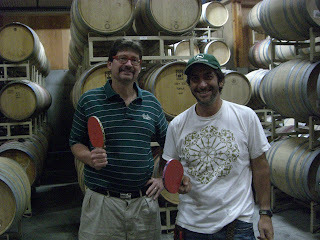 Matt wanted to talk about wine ("The estate vineyard is planted to 20 1-acre blocks. It's nightmare farming") and picking ("We do 'gringo picking.' My office staff has to help out.") I was antsy to play; I think he noticed, like a pitcher holding the ball while the batter fidgets. Finally we got down to business. Early on the game unfolded in a promising way: I would leave a ball bouncing high, and Matt, anxious for the macho point, would slam it too far and miss the table. He played to my backhand, which was weak, and my aim was off enough that I couldn't make him cover the whole table. But with his wildness, I was hanging in there, and my serve started to come back. I led him 16-14, going into his serve, but I melted down like Armando Benitez. Or, he picked it up a notch -- he served five points in a row. I didn't recover; my last serve was a meatball to his forehand, and he put it away. I lost 21-16, gnashing my teeth with the feeling that I could have had this game. The sommeliers pointed out that, as a gambler, Matt was probably hustling me. He denied it: "My muscles were tight," he said. "Besides, I play better from behind then ahead. I have a problem with losing leads." To wash the bitter taste of defeat from my mouth, he opened a few more wines. I tended to like the ones he disavowed -- the '06 Sticks and Stones, which he thought had too much acid, was my favorite: raspberry fruit, good spiciness, a cooked-meat gaminess and a pretty bergamot note. The label lists percentages of Grenache, Mourvedre and Syrah but Matt gives that surfer laugh when you ask about them, because with his method of winemaking he can't really be sure. I also loved his 2000 LC Red, made the year before he said he was influenced by Australian Shirazes into making his wines more "flamboyant." Big, low-acid wines are the stereotype of Paso Robles reds, and it would be shocking for an Old World drinker to hear some of the ways Matt describes wines. About the '06 Sticks and Stones, he said, "It's fine to drink it with food, but it's not going to be as good on its own." But let's be realistic here: That's how many Americans drink red wines, as stand-alone beverages. At least these wines are very smooth on the palate. Perhaps because they're co-fermented, they're practically seamless. Jake Kosseff, wine director at Wild Ginger in Seattle, loved Matt's wines, saying, "They've got this beautiful full palate. The midpalate of wine is what makes them hedonistically wonderful. These wines have that in spades. Nothing flies out in one direction or another. There's a subtle interplay of flavors, but there's a lot going on." And then there's Matt's personal story. He was a college roommate at Cal Poly-San Luis Obispo of Justin Smith of Saxum; Smith's father gave Matt his first winemaking book. Matt liked the area, so when he graduated with a degree in biochemistry, in 1995 he took a job with Justin Winery (no relation) for $1000 a month. "When you're so cheap, people can't fire you," he said. The job was theoretically forklift driving, but the winery was small and expanding, so he helped plan and build buildings, handled some bulk wine transactions, did cellar work, etc. He started sleeping in his car on late nights, rather than drive home for an hour, and eventually gave up his apartment for a while and lived in it. In 1997 he took at better-paying job at Wild Horse as a forklift driver, and was disappointed to learn that was all they expected of him: no punchdowns from the DOF ("dork on fork.") He made 20 barrels of wine with Smith because he was bored. 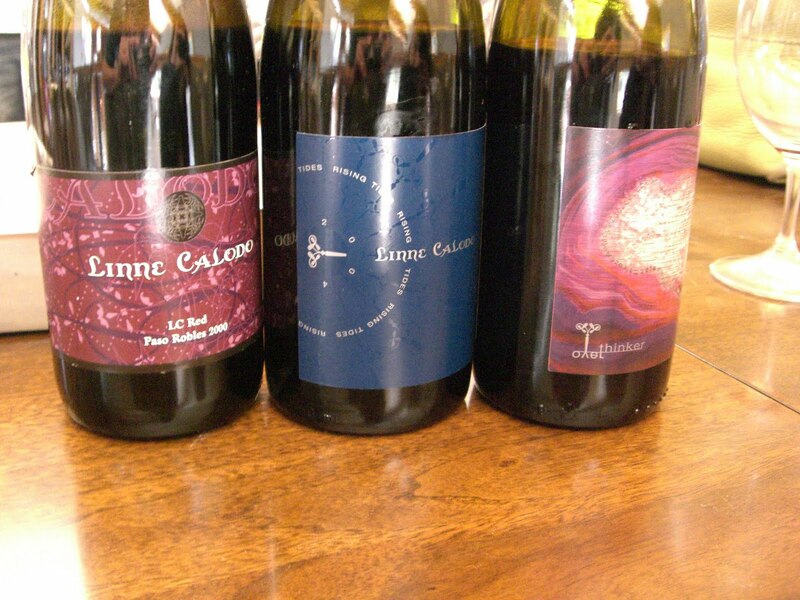 He and Smith started Linne Calodo together; Smith eventually split off into Saxum, where the wines have even higher ratings and higher prices than Matt's. Matt managed to save $4000 by the spring of 2000 but had to spend it all on labels and capsules because nobody would extend credit to the DOF. "What else was I going to do?" he says. Finances have changed for Matt. For a decade he's been selling 4000 cases of wine, much of it over $50, almost entirely through a mailing list -- which means no distributors or retailers take big chunks of the money. And he saves on labor by doing so much himself. Matt drove his own backhoe while building his new, functionally attractive, wooden winery -- high ceilings with outflow fans reduce his need for air conditioning in Paso's 100-degree summer days. A few miles away there's a newish winery whose owner made a fortune in investing and casually dropped $60 million of it to build a winery/monument to capitalism. I prefer rooting for guys like Matt. But I'm not actually rooting for him, not in ping-pong. He's better than me, I acknowledge it. And he plays all the time. And he may have been hustling me. Nonetheless, I can take him. Maybe I can't beat him 5 out of 9, but in at least one single game, I can take him. An Open Letter To Matt Trevisan: You may be smiling now, but this isn't over. As a consumer of wine, we're flooded with reviews, marketing, points, opinions, and other "noise" from the wine industry, and while there are hundreds, or even thousands of good to great wines out there, for consumers like me, it's the ones that I have a personal connection to ( like the oregon winemakers I've gotten to know over the years ) or the winemakers with truly interesting stories that influence my wine buying. Sorry for the run-on sentences.. but this is a quick response for me. Thanks again for a great read.. you're truly living the dream. I love this post. I spend a lot of time reading reviews about Paso winemakers, this was totally entertaining and unique. And I learned something new. Thanks! Another week, another chuckle. Thanks for for sharing.